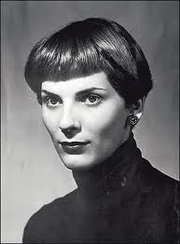 Elizabeth Jane Howard (March 26, 1923-January 2, 2014) was a British novelist. Not to be confused with mystery writer Elizabeth Howard. Elizabeth Jane Howard, known as Jane, worked briefly as an actor in provincial theater before marrying Sir Peter Scott in 1942, at age 19. They had a daughter, Nicola, and divorced in 1951. A second marriage, to Jim Douglas-Henry in 1958, was brief. Her third marriage to novelist Kingsley Amis lasted from 1965 to 1983. She published her first novel in 1950 and her autobiography, Slipstream, in 2002. Elizabeth Jane Howard is currently considered a "single author." If one or more works are by a distinct, homonymous authors, go ahead and split the author. Elizabeth Jane Howard is composed of 7 names. You can examine and separate out names.